Han Suyin was the pen name of Elizabeth Comber, born Rosalie Matilda Kuanghu Chou. She was a China-born Eurasian, a physician, and author of books in English and French on modern China, novels set in East and Southeast Asia, and autobiographical memoirs which covered the span of modern China. 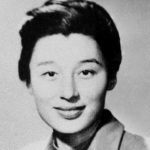 These writings gained her a reputation as an ardent and articulate supporter of the Chinese Communist Revolution. She lived in Lausanne, Switzerland, for many years until her death.